The HDM Split sprocket is CNC machine from Aircraft Quality Alloy aluminum. All sprockets are for #35 chain and fit the standard sprocket hubs found the market today. 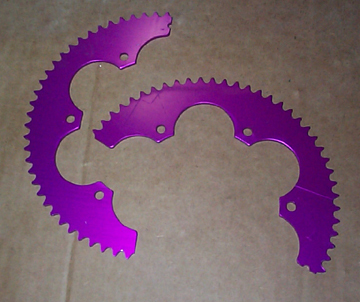 The sprockets are anodized Purple or Red (buyer does not have choice) to give an added layer of wear resistance. During our testing period many racers asked about skip tooth sprockets. After much research and discussion among racers (mostly on Bob's 4 Cycle), HDM has decided not to offer a skip tooth sprocket at this time. Although the axle may seem to spin easier on the stand, no noticeable gain in lap times are found with a skip tooth.